Golfers can’t approach the level of tour pros because they’re physically unable to match a pro’s swing. Golf tips and swing advice can only take one so far. In order to truly correct a flawed swing, the causes of the problems must be treated, not the symptoms. 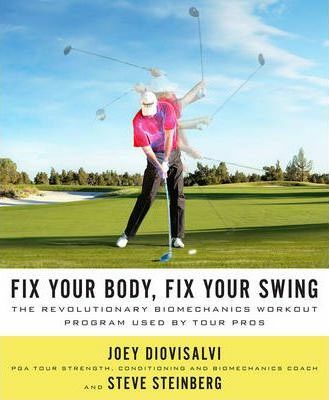 This revolutionary golf fitness book incorporates the latest in biomechanics (the mechanics of the body and the forces of muscles and gravity) to fix swing flaws while strengthening the body’s core and improving strength and balance to help golfers of all levels swing more like the pros. Beginning with assessments that determine where a golfer’s body is too tight, not strong enough or out of balance, “Fix Your Body, Fix Your Swing” then provides specific, easy-to-follow exercises that correct whatever problems or limitations were revealed in the assessments. Just three twenty-minute workout sessions a week (only one hour a week!) will help anyone become a better golfer with a healthier, stronger body.